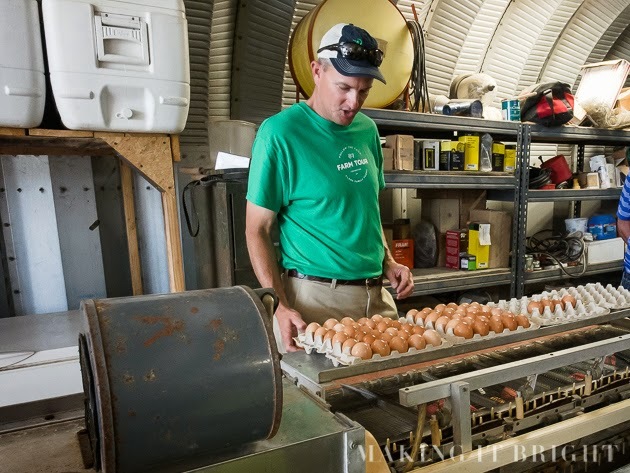 We spent a few hours at Clark Family Farms on a tour with owner, Todd Clark. It was great and informative. First we visited the chick brooder (where the baby chicks live). Our son just kept saying, "Oh, how cute!" :) Just lots of little fluffy chickens running around and cheeping. Next we walked to where the chicken broilers were. 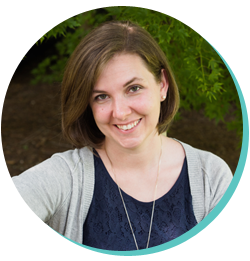 It takes seven weeks from brooder to "finished" chicken. 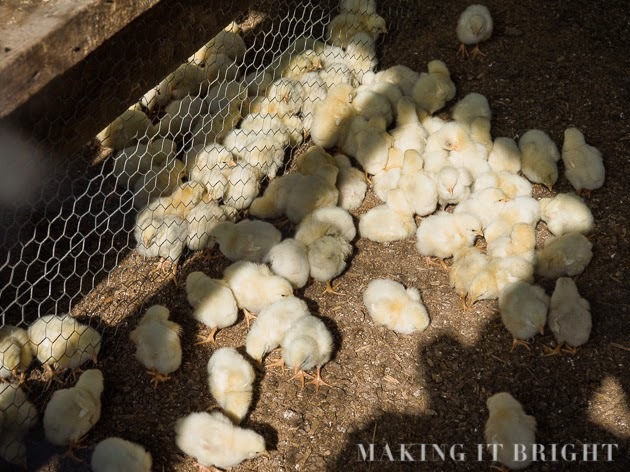 For that particular farm, chicken broilers are seasonal since they have them out in the pastures. The chickens finish at around four pounds. The shelters, covered by old billboards purchased on eBay, are moved once daily by two people. The billboards last approximately 4-5 years versus less than one year for a blue tarp. 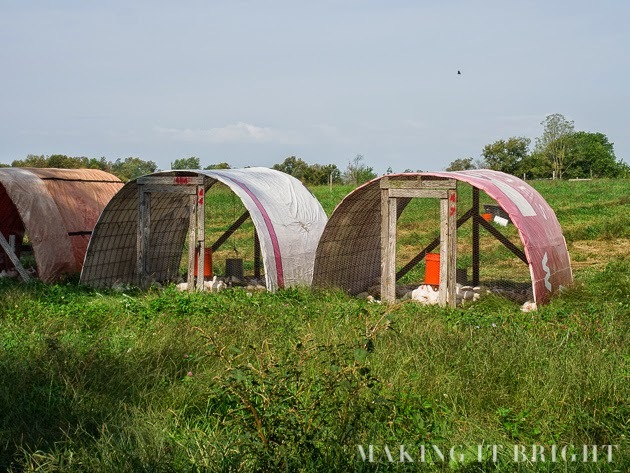 Each shelter holds 50 birds, with 1.5 square feet for each chicken. Someone on the tour then asked why they weren't free range. Mr. Clark, the owner, said that this particular breed (Cornish Cross) didn't free range well, they would just hide under a tractor or whatever else they could find. Also, they have quite a few natural predators in the area. This pasture was surrounded by an electric fence, not so much to keep the chickens in, but to keep the raccoons out. The shelters they live in also help to protect them from hawk attacks. The chickens are processed at another farm, Marksbury Farm. Mr. Clark said that Marksbury can process 800 birds per hour, much more efficiently than he could at his farm. The chickens go to local restaurants in Lexington, and also to restaurants in Louisville, Cincinnati, and Nashville. The vast majority of their chickens (approximately 12,000) went to Jefferson County Schools and fed two-thirds of the students ONE meal. 12,000 chickens. One meal. There were also two shelters that contained young turkeys. Mr. Clark said that it takes 15 weeks from start to an 18 pound bird. Hello, Thanksgiving dinner. Then on to the grass finished beef. 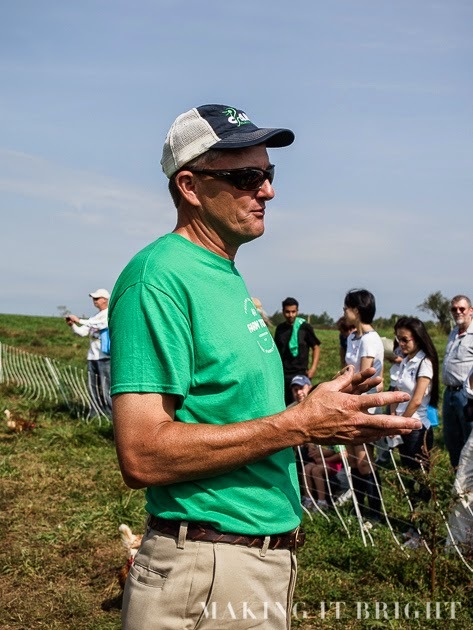 Clark Family Farms has five birth farms already established and Mr. Clark visits each of those four to five times per year to ensure that the cows are being raised/fed to their standards. At this particular farm, they buy year old baby cows from other previously vetted farms. One year after that (when the cows are between 24 and 28 months of age), they are ready for slaughter. This is a year-round operation and the beef is processed at Marksbury Farm and the majority is sold at our local Whole Foods. The cows are rotated to a different paddock once daily, and there is a 40 to 45 day rotation on the paddocks. Mr. Clark practices Joel Salatin's philosophy of farming. There is a symbiotic method of feeding. 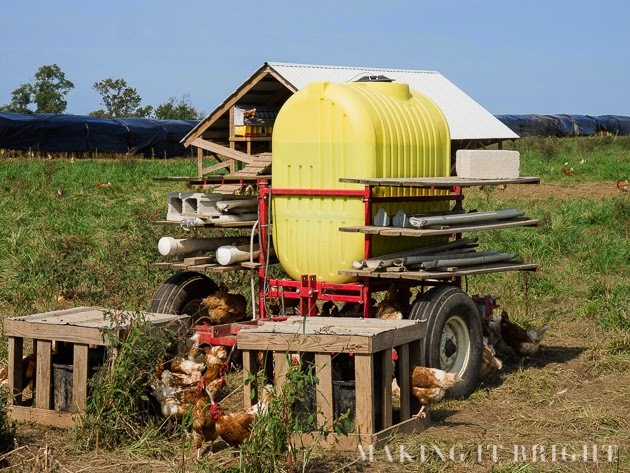 The cows are moved from pasture to pasture, and are followed by the chickens where they eat the bugs left behind on the cow droppings and fertilize the land with their own waste. I had read about this in The Omnivore's Dilemma and attempted to explain it to Mr. Making It Bright as "the chickens follow the cows and eat the bugs in their poop and poop to make the grass better for the cows that will come later." Very scientific... (at least for this liberal arts major). 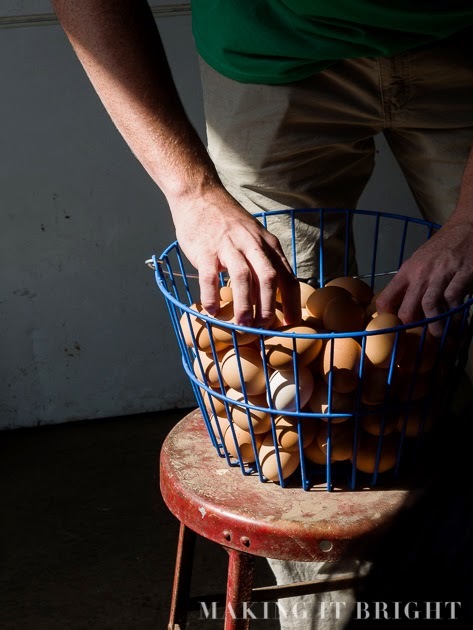 Egg production is starting to slow down as day length is getting shorter. The hens will be moved into what we think of as a typical chicken house and will be kept warm in there over the winter. Then we saw the grass finished sheep. They are katahdin sheep, which naturally shed their wool (no extra farm work there). The meat produced by those sheep is tender. They lamb in April, approximately 1.5 lambs per mother, and the sheep are ready for market now at approximately 100-110 pounds. Not a terribly exciting part of the tour, in my opinion. They were too far off to see very well. We finished the tour at the Egg Wash. Someone along the tour asked if the farm was certified organic. Mr. Clark responded that they were doing everything to be organic, just hadn't messed with the certification process. I think we've all learned that just because something is stamped "organic" doesn't necessarily make it superior. To me, it's just a form of vetting to help us narrow the overwhelming choices in our supermarkets. I thoroughly enjoyed my farm tour and I cannot wait to tour more local farms. 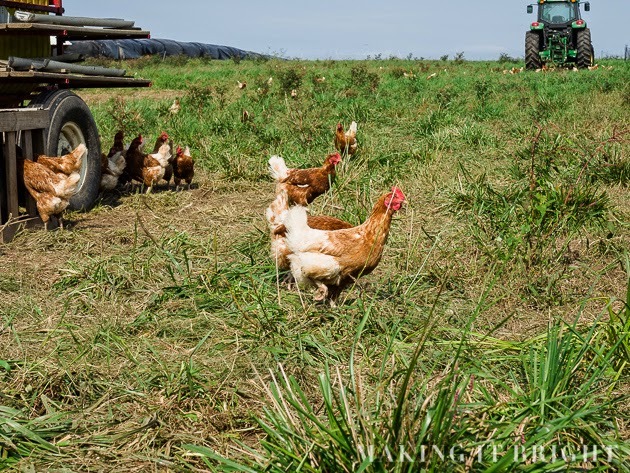 I would feel comfortable eating any of the animals/eggs from this farm after seeing the conditions in which they live and meeting the farmer. But we can't do this with everything we eat. So it's back to trial and error and doing a "good enough" job at making reasonable food choices in a sea of confusing packages and labels.